The game had gotten to Joe Torre. He sat in the visitors' dugout at Fenway Park and watched Red Sox catcher Jason Varitek ground out to end the thing, then turned to hawkeyed pitching coach Mel Stottlemyre, because Torre always turned to Stottlemyre after a game and shook his hand. "Should we sit here for a minute just to make sure the game is over?" Torre asked Stottlemyre. Torre did not mention it to the reporters who asked afterward about Mariano Rivera almost self-destructing in the eighth inning, but the kind of exhaustion Torre felt that day in Boston reminded him of what it had been like four years earlier, going through his fight with prostate cancer. "That eighth inning was probably the toughest I've ever had to endure," Torre confided the next morning. "We have the best closer in baseball. To see it starting to fall apart makes for a very uneasy feeling for me. Once I get Rivera in the game, there is no other strategic thing I can do. I have to sit and watch. It's like sitting at home waiting for the doctor to call and tell you you're all right." Red Sox owner John Henry had written the game off in the top of the ninth, and his thoughts went to his counterpart, Yankee owner George Steinbrenner, who earlier that season had cried after the Yankees came out on top in another wild Yanks-Sox game. He directed the question to Red Sox CEO Larry Lucchino, sitting nearby in Henry's nearly empty luxury box behind home plate. Lucchino, notorious for his "Evil Empire" taunting of Steinbrenner and the Yankees the previous off-season, could only muster a tight smile. Like Joe Torre, Henry and Lucchino were so depleted by the time Varitek grounded out to end the game, they did not know what to do with themselves. Lucchino squeezed an empty plastic water bottle so hard it cracked, and finally stood up slowly, as if he were testing his joints. "This is the way the game ends," Henry said. "Not with a bang but a whimper." Yankee general manager Brian Cashman got up from his seat behind home plate and let loose with a sound like air being released from a tire. His stomach felt hollow. He thought to himself that if he did not eat something soon, he might pass out. They would love that in Boston. The night before, he had left Fenway Park after the Red Sox soundly thrashed the Yankees and fielded a phone call from Steinbrenner. The owner wanted to know if his general manager was really at the game. "I didn't see you," Steinbrenner said. "Well, I was behind home plate," Cashman said. That was not good enough for Steinbrenner. He wanted Cashman to sit right by the Yankee dugout so the players would be reminded every time they ran back in from the field that he was there keeping an eye on them. "I want you where I can see you!" 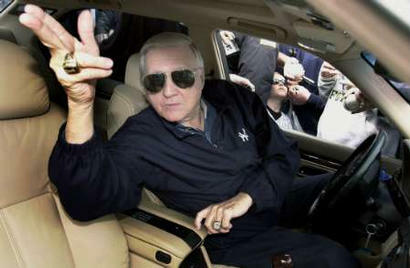 Steinbrenner said. "I want you by the dugout! You sit in my seats!" But Cashman had not sat in Steinbrenner's seats. He had sat behind home plate, just as he had for Friday night's opener of the three-game series, and if the Yankees had lost the game, Cashman knew he would have had to listen to more shouts of "I didn't see you!" No wonder he felt relieved. Down the first-base line, a few rows back from the field, Debi Little tried to avoid the obvious thoughts for any wife of a big-league manager, especially a Red Sox manager. Every win was one more day without worry, and every loss meant it was time to wonder where she and her husband would be next year. Her husband was more philosophical about the uncertainty than she was. He knew he would be second-guessed, disparaged, and dismissed. He knew that if his team did anything less than win the World Series, he would be to blame. Grady had learned patience during the five years he spent driving a tractor through his cotton fields in Texas, cranking the country tunes and sometimes working right through the night. He knew better than to think the criticism a manager faced in Boston really said that much about him. Heck, Grady Little liked to tell people about how he could lay claim to being the first manager ever fired by George Steinbrenner, and that had been thirty years earlier. He knew how things went. One of his strengths as a manager was his lack of illusions, and that applied to himself and his own prospects, too. For Debi, it was impossible to gain any distance. Sometimes she thought back to those first weeks after she and Grady started dating. He introduced her to his father, who had an immediate challenge for her. "Hi, how are you?" he asked her. "Do you know what a triple is?" Grady's father wanted Debi to know she would be marrying baseball, too. "Yes, sir, I do!" she had told him. Debi would not have it any other way, all these years later, but sometimes she did feel worn out by all the ups and downs. Mariano Rivera took the flip from Nick Johnson and stepped on first base and the game was over and Debi, too, sat and waited. It took so much out of her, putting all this emotion into a game. She needed a few minutes to catch her breath and put on a brave smile before she could walk up to the Family Room near the Red Sox clubhouse and try to set a good example for the other wives. Senator George J. Mitchell was not a man who liked to hurry, but he was in a hurry now. His airline would call his name if he did not report to the gate for his flight to London and on to Belfast. So far he had checked half a dozen sets, and had no luck. Up ahead was a small lounge that was sure to have a TV. Mitchell, never sentimental except where baseball was concerned, allowed himself to hope for a break. But this TV, too, was tuned to a news channel. 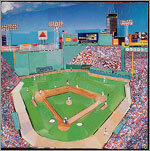 Mitchell had been at Fenway until the sixth inning and pulled himself away for the drive to Logan. Post-September 11 security headaches forced even former Senate majority leaders to make adjustments in their schedules. The taxi ride from Fenway brought immediate disappointment: no radio. How could a taxi not have a radio? All Mitchell could do was ask the driver to hurry. He made it to Logan with time to spare, and changed cars and drove with his friends in giant circles through the maze of the Logan parking structure. They hunted for patches of good reception to follow as much of the eighth inning as possible. Now Mitchell was out of time. But before he handed over his ticket and took his seat, he called the Red Sox switchboard to ask what had happened. "The Sox lost," he was told. Once on the plane, Mitchell let his thoughts wander. Somewhere near Newfoundland he was finally able to tell himself, "Oh well, we'll get them tomorrow and next weekend in New York." And with that, the chief negotiator of the Good Friday Agreement in Northern Ireland drifted off to sleep. One thousand, six hundred and forty-seven miles south of Boston, the game playing out at Fenway Park had come to feel a lot more distant to the people watching from the Champions Sports Bar in Santo Domingo, Dominican Republic. The sports bar had TV sets sprouting up in every nook and cranny, but none had shown Rafael Avila anything he wanted to see. He was the one who had first seen what Pedro Martinez was, and what he would be in baseball. Avila did not discover Pedro Martinez. No one discovered Pedro Martinez. Pedro just was. Avila still smiled thinking of young Pedro, a skinny fourteen-year-old kid who was always tagging along with his older brother Ramon, another future big-leaguer. Pedro carried Ramon's bags, ran errands, anything at all, just so long as they let him hang around with the Dominican junior national team that Avila was managing. Young Pedro was always asking to play, so they would send him out to fill in at shortstop, or left field, or second base, anywhere and everywhere. He soaked up as much baseball as he could and listened closely to anything Avila said. Back then he was all promise. But now as Avila looked around at the kitsch on the walls of the Champions Sports Bar and nursed his Campari and ice, he knew that Martinez had started down the long, slow slide that sooner or later pulled all great athletes back toward ordinary. Out in left field, inside the Green Monster, Rich Maloney was not taking it well. You had to be a fan to work in the empty space behind the left-field Wall game after game after game, putting up numbers by hand, and Maloney had been working out there thirteen years. He was not thrilled with Grady Little's managing choices that afternoon. He thought he had let Joe Torre dictate events. Maloney looked out through his small peekhole and saw two doves touch down on the warning track just outside. He hoped it was a sign. The doves glanced at each other quickly, and flew off. As Joe Torre was not shaking Mel Stottlemyre's hand, and Larry Lucchino was crunching his spring-water bottle, and John Henry was staring silently out over the field, and Brian Cashman was exhaling, and Debi Little was collecting herself, and George Mitchell was hurrying around Logan Airport, and Rafael Avila was looking around the sports bar in Santo Domingo, Rich Maloney was reaching for a metal rectangle painted with that most inarguable of baseball figures, the zero. He was almost in a hurry to hold it up. Like many fans, he had a perverse desire to get on with it and accept the worst outcome as soon as possible. But instead of putting the figure up on the board for the bottom of the ninth inning, once Rivera touched first base, he turned to a visitor spending the game with him behind the scoreboard in left field. "Want to do the honors?" he said with a sly smile, handing over the white zero. "Put a fork in it."